Here at Tic Toc Nursery we are fully committed to a healthy eating programme, delivering quality food to all our children. All meals are included in the fees and are specially prepared each day on the premises by our on-site chef using the highest quality fresh ingredients. Breakfast is served between 7.30am and 8.30am each morning (only available to children attending the early morning session). 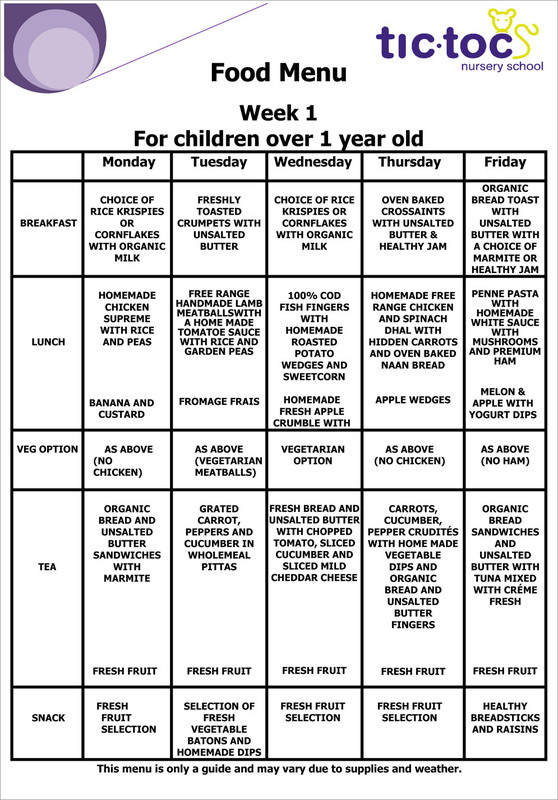 Children are provided with two main meals a day served at 11.30am and 4.00pm. Healthy snacks (and milk) are served at approximately 10.00am and 2.00pm. Fresh drinking water is always available. Please note serving times may vary. We cater for all dietary needs and vegetarian options. We also cater for babies that are weaning and progressing to solids. Meal times are used as a time to develop social interaction and independence. We also teach the children the importance of healthy eating. Click here to read or download our current Tic Toc pdf menu.